One of Britain’s top climate scientists has launched a blistering attack on actress Emma Thompson and the BBC, accusing them of ‘scaremongering’ over the speed of global warming – and risking a worsening of the refugee crisis. Richard Betts, head of climate impacts research at the Met Office and a professor at Exeter University, launched his attack on Twitter about an interview Ms Thompson gave to Newsnight presenter Emily Maitlis last Wednesday. He followed it up with a longer critique – an extract of which this newspaper publishes today – on the website of HELIX, a prestigious EU-wide climate research programme which he also directs. The actress, a Greenpeace activist who that morning had taken part in a protest against Shell’s plans to drill for oil in the Arctic, warned that if the drilling went ahead, the world would be a staggering 4C hotter by 2030. Ms Maitlis did not challenge her. In his blog post, Prof Betts points out that the authoritative UN Intergovernmental Panel on Climate Change gives a ‘wide range of estimates of the speed of future warming’ – but none of them is anywhere near 4C by 2030. He adds that under the highest scenario for future emissions, ‘the earliest time of reaching 4C above pre-industrial was around 2070, and the latest sometime after 2100’. A BBC spokeswoman said: ‘In a longer interview Emily would have pressed Thompson to justify her assertion.’ She refused to say whether the BBC would be correcting Ms Thompson’s statement. In a recent BBC Newsnight item, the actress Emma Thompson spoke passionately and in no uncertain terms about 4C warming by the year 2030, and stated that ‘in a few years… whole swathes of the Earth will become uninhabitable’. These statements do not reflect what the science actually says. Some might argue that the focus should be on worst-case catastrophic scenarios, leaving no room for doubt, in order to promote urgency in emissions cuts. It’s certainly easy to see why this might be tempting, as global emissions have continued to rise despite clear indications that unchecked climate change poses large risks. This seems to be the case in Emma Thompson’s recent BBC Newsnight item. Does this matter? What’s the harm in a bit of exaggeration if it’s in a good cause? To my mind, there are three reasons why it’s a problem. Firstly, making wild predictions that don’t come true obviously harms your credibility. It’s the old ‘boy who cried wolf’ story – he made up the story of the wolf, so when it eventually did come, nobody believed him. There was a wolf, but only later on. When the world has not become a barren wasteland within a few years, it will be easy for critics to say that the whole climate change problem has been exaggerated. It has not been exaggerated – at least not by mainstream science – but that will be easily overlooked when harking back to these claims. Secondly, if people come to believe that catastrophic impacts are only round the corner, this could lead to wrong decisions made in panic. A lot is being done to make us more resilient to the climate change we’ve already set in motion – new flood defences, plans for reservoirs and water supplies, and so on. But these are expensive, and doing these too early could cost billions. And if people are scared into moving away from their homelands because they think it will be uninhabitable, this would only add to the existing refugee crisis, for no good reason. Finally, even if the world does make major emissions cuts very soon, this will take time to filter through into tangible effects on global warming. There is already more warming in the pipeline which is unavoidable. Therefore anything projected for the next few years is already unavoidable. If ‘whole swathes’ really will become uninhabitable ‘in a few years’, then there is absolutely nothing we can do about it, however urgently we cut emissions. Whether Shell drills for Arctic oil or not, the changes for the next few years are already locked in. Emma Thompson’s apocalyptic vision is therefore one of despair, not something that can credibly be avoided through action, however drastic. Fortunately, while Ms Thompson’s concerns are valid in the longer term, her timing isn’t supported by the science. Higher levels of climate change and the associated risks are further off than she fears, and hence could still be avoided. Whether we choose to attempt to do this or to try instead to live with the risks is a choice the world needs to make. There are no easy options, and such a choice is hugely important. It needs to be properly informed by sound science, communicated responsibly to the world. The sun’s activity could be affecting a key ocean circulation mechanism that plays an important role in regulating Greenland’s climate, according to a new study. The phenomenon could be partially responsible for cool temperatures the island experienced in the late 20th century and potentially lead to increased melting of the Greenland ice sheet in the coming decades, the new research suggests. The abrupt Northern Hemispheric (NH) warming at the end of the 20th century has been attributed to an enhanced greenhouse effect. Yet, Greenland and surrounding subpolar North Atlantic remained anomalously cold in 1970s- early 1990s. Here, we reconstructed robust Greenland temperature records (NGRIP and GISP2) over the past 2100 years using argon and nitrogen isotopes in air trapped within ice cores, and show that this cold anomaly was part of a recursive pattern of antiphase Greenland temperature responses to solar variability with a possible multidecadal lag. We hypothesize that high solar activity during the modern solar maximum (ca. 1950s-1980s) resulted in a cooling over Greenland and surrounding subpolar North Atlantic through the slow-down of Atlantic Meridional Overturning Circulation (AMOC) with atmospheric feedback processes. 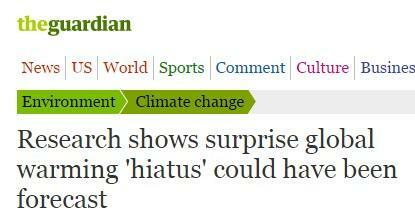 Leave it to the Washington Post to spoil good news with climate alarmism. Science and environment reporter Chris Mooney reported that a new study of trees concluded the world’s tree population was 7.6 times greater than previously estimated. The researchers calculate that there are more than 3 trillion trees on the planet, 2.64 trillion more than they’d thought there were. To the average person that sounds like great news. However, Mooney and the scientists he consulted claimed this is not good news. Mooney quoted Thomas Crowther, one of the study’s authors, who said, “We can now say that there’s less trees than at any point in human civilization.” Crowther is a postdoctoral researcher at the Yale School of Forestry and Environmental Studies. The rest of the Post story and the scientists it quoted complained about the threat of climate change and deforestation. Mooney quoted one of the 38 co-authors of the study, but turned to three other individuals not involved in the research to provide commentary about it. One of them, conservation biologist at the United Nations Foundation Thomas Lovejoy who is also a supporter of climate alarmist Al Gore -- speculated that the study, “does not say there’s more forest. It just says there’s more trees in the forest.” Lovejoy also suggested that the existence of an additional 2.64 trillion trees does not change the the current understanding of deforestation rates throughout the world. The study was originally inspired by a request from Plant for the Planet, a youth organization which “leads the United Nations Environment Programme’s ‘Billion Tree Campaign.’” Plant for the Planet asked Crowther to provide a baseline number of trees so they would know how many more to plant in order to reach their one billion goal. While looking for quotes on an upcoming post about Ocean Heat Content, I ran across the press release for a new paper (in press) by Neely et al, which blames the recent slowdown in global warming on smaller more moderate volcanos. "These extracts from the Greenwire article illustrate why the climate system is not yet well understood. The science is NOT solved"
Judith Curry provided running commentary in her post "Candid Comments from Global Warming Scientists". If you haven’t read it, it’s a worthwhile read. "A team led by the University of Colorado Boulder looking for clues about why Earth did not warm as much as scientists expected between 2000 and 2010 now thinks the culprits are hiding in plain sight — dozens of volcanoes spewing sulfur dioxide. The study results essentially exonerate Asia, including India and China, two countries that are estimated to have increased their industrial sulfur dioxide emissions by about 60 percent from 2000 to 2010 through coal burning, said lead study author Ryan Neely, who led the research as part of his CU-Boulder doctoral thesis. Small amounts of sulfur dioxide emissions from Earth’s surface eventually rise 12 to 20 miles into the stratospheric aerosol layer of the atmosphere, where chemical reactions create sulfuric acid and water particles that reflect sunlight back to space, cooling the planet." The paper (in press) is Neely et al (2013) Recent anthropogenic increases in SO2 from Asia have minimal impact on stratospheric aerosol. "Observations suggest that the optical depth of the stratospheric aerosol layer between 20 and 30 km has increased 4–10% per year since 2000, which is significant for Earth’s climate. Contributions to this increase both from moderate volcanic eruptions and from enhanced coal burning in Asia have been suggested. Current observations are insufficient to attribute the contribution of the different sources. Here we use a global climate model coupled to an aerosol microphysical model to partition the contribution of each. We employ model runs that include the increases in anthropogenic sulfur dioxide (SO2) over Asia and the moderate volcanic explosive injections of SO2 observed from 2000 to 2010. Comparison of the model results to observations reveals that moderate volcanic eruptions, rather than anthropogenic influences, are the primary source of the observed increases in stratospheric aerosol." Bottom line: There’s still no consensus from climate scientists about the cause of the slowdown in the warming rate of global surface temperatures. And of course, the sea surface temperature and ocean heat content reveal another reason: there hadn’t been a strong El Niño to release monumental volumes of warm water from below the surface of the tropical Pacific and shift up the sea surface temperatures of the Atlantic, Indian and West Pacific Oceans. Refer to my essay “The Manmade Global Warming Challenge” and my ebook Who Turned on the Heat? Predictably, Labor’s dissenting report is filled with fantasy, fallacy and fiction – pumping up the ‘wonders’ of wind; completely ignoring the cost of the single greatest subsidy rort in the history of the Commonwealth; and treating the wind industry’s hundreds of unnecessary victims – of incessant turbine generated low-frequency noise and infrasound – with the kind of malice, usually reserved for sworn and bitter foreign enemies. And the wind industry’s stooge on the Inquiry, Anne Urquhart – is still out their fighting a faltering, rearguard action – long after the battle for wind power supremacy was lost – a bit like the tales of ragged, 80 year old Japanese soldiers that kept fighting the Imperial War, until they were dragged out of the jungle and into the 21st Century. Nevermind the facts, when delusion will do! Among those Senators on the Committee – who pulled no punches in getting the truth out – were Liberal Senator from WA, Chris Back and STT Champion, Liberal Democratic Party Senator, David Leyonhjelm from NSW. While the wind industry and its parasites have been praying to the Wind-Gods that the whole thing might just ‘blow over’, those Senators on the Inquiry – not in thrall of Infigen, Vestas & Co – are still in there fighting for a fair-go for rural communities, across the Country; and power consumers, everywhere. Always pleased to disappoint the beleaguered and dwindling band of wind worshippers in this country, STT is delighted that Chris Back and David Leyonhjelm show no sign of letting up.